The DNCE singer was spotted having a lunchtime date with the Costa Rican beauty in Los Angeles on Monday afternoon (15Feb16), before they attended a post-Grammys bash at Hollywood hot spot Hyde later that night. Just two days before, she was reportedly showing her support for Jonas' band at the Diesel party during New York Fashion Week on Saturday night (13Feb16). "They are not an exclusive couple yet just dating," a source tells E! News. "He is not looking for anything serious at this moment, but really enjoys her company and she is a fun girl." 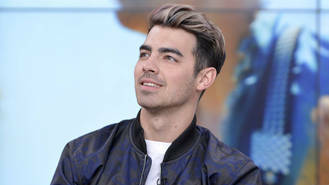 Jonas' new romance comes weeks after his short-lived relationship with another model, Jessica Serfaty, came to an end. Jonas was first photographed kissing the former America's Next Top Model contestant during a skiing trip to Mammoth Lakes, California in January (16). It was subsequently revealed the couple had met through a mutual friend and had spent the festive holidays in Las Vegas together. "They're not even talking anymore," a source told People.com of Jonas' breakup with Serfaty. "That (relationship) was made into a bigger deal than it was." Prior to dating the former America's Next Top Model contestant, he was romantically linked to one of the most in-demand models in the world, Gigi Hadid. She has since moved on to date former One Direction star Zayn Malik.